What if the success rate among traders is low, not simply because of the complexity of markets, but because the learning methods traders employ are not suited to complexity? What if the greatest edge we could achieve in markets comes, not from another indicator or software tool, but from revolutionary ways of learning and understanding markets? Considerable research suggests that active learning methods are superior to passive ones, with particular benefits associated with team-based learning, including greater engagement of students and greater depth of learning in such fields as medicine and psychology. As I note in the latest Forbes article, structuring mentoring and coaching within trading teams has greatly increased the success of training traders. The technique of the daily report card, in which traders review key aspects of their trading daily and share their grades and observations with mentors, coaches, and peer traders, has meaningfully accelerated the learning curves of many traders who have adopted this framework. 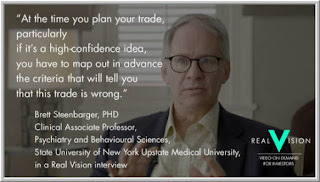 If you have not achieved the trading results you desire, I encourage you to consider the possibility that the problem may not lie with your psychology or with your use of any particular set of trading tools. Rather, you may be honing your skills in entirely the wrong way. 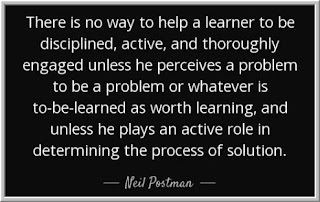 You would never learn and master basketball, chess, or surgery in a classroom or through videos, followed by solo experimentation. Why would the performance domain of trading be any different? I encourage you to reflect upon the daily report card framework and how turning learning into an active and interactive enterprise could accelerate your learning curve. Here is the link to the recent Best Practices of Best Traders webinar sponsored by Futures.io. The sound quality is not great in the very first portion of the session, but we get that corrected for the majority of the presentation. My apologies about that. A very important takeaway is that, at certain times, *you* are a best trader. It is when you are trading at your best that you discover your best practices. 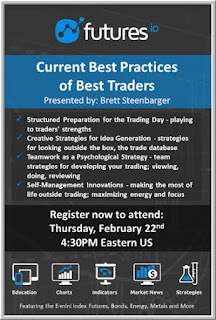 * How do I generate my best trading ideas? What do I look at? What information do I draw upon? How do I best prepare for trading with research? With conversations with other traders? When I figure out what is going on in a stock or in a market, what exactly am I figuring out? What patterns in market behavior make sense to me? How do I best detect those patterns? * How am I best at risk taking? When I'm trading well, how do I determine as quickly as possible that my idea and/or my trade are wrong? How do I decide to take quick profits, and how do I decide to let trades run? In my best trading, how do I size positions? How do I respond to winning trades and losing ones? * In my best trading, how am I managing myself? How do I best sustain focus? How do I keep my energy level high? How do I maintain a quality life outside of trading? When I'm trading well, how do I take breaks during the trading day? How do I best use my time before trading starts and after? Focusing on these questions will help you understand the ingredients that go into your trading success. As I emphasize in the Trading Psychology 2.0 book, it's not enough to simply note our best practices. The goal is to turn these successful practices into positive habit patterns and ongoing processes. A huge part of trading success is becoming more and more consistent with our strengths...more and more consistent in doing what we do when we are successful. Kudos to Downtown Josh Brown for picking up on a Bloomberg article by Ben Carlson that illustrates how it's not rising rates that are a threat for stocks, but inflation. Ben notes the human tendency to think in narratives: this is happening because of that. Such narratives quickly become consensus within and across trading floors. That leads to a kind of conformity born of laziness. Traders don't develop their own models of rates and inflation, so pick up on dominant narratives. Excellent shorter-term opportunities can arise when those narratives are driving trader and investor behavior and excellent longer-term opportunities can arise when those consensus narratives are disconfirmed. 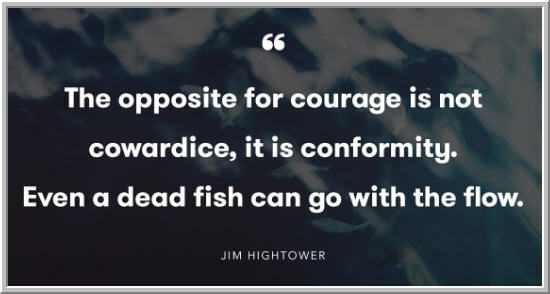 Jeff Miller points out that trading problems typically arise when markets change and we are no longer in our comfort zones. (His site, by the way, does a nice job of tracking inflation numbers, economic sector by sector.) We become particularly uncomfortable when our dominant narratives are challenged. When we can't make meaning out of what we're seeing, we understandably behave in reactive ways to lessen our discomfort. We gain flexibility when we view market narratives as hypotheses and not as conclusions. 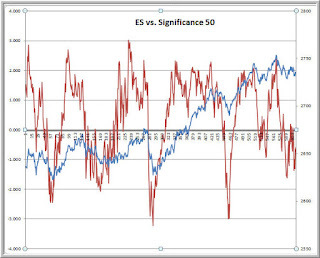 This is where tracking correlations among markets can be incredibly helpful. So often, traders focus on their own markets, failing to notice macro drivers that--rightly or wrongly--are impelling near term market flows. On Friday, I was chatting with a valued trading colleague and we noted early in the session that the market's dominant cycle was cresting. 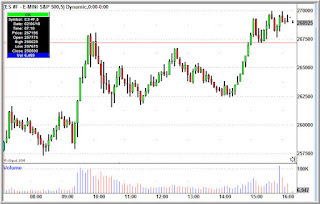 That led to a nice, early short trade in the ES futures. As rates began to move lower, however, and stocks could not sustain downside momentum, I recognized that the "lower bonds, lower stocks" risk-parity bears had an opportunity to be trapped. The unwind of that narrative led to nice trades as we detected the potential to move from a cyclical to a trending short-term trading environment. There's a dirty secret no one likes to talk about: large traders often don't do their own research. They construct narratives based on recent price action and what others are saying on the sell side, trading floors, etc. That conformity creates opportunity and is a great reason for tracking market chatter--but only as hypotheses! From an evolutionary perspective, it makes sense that we make complex behaviors automatic. Once we can perform tasks mindlessly, we can direct our mind to more immediate, pressing matters. This is how we can drive a car and hold a meaningful conversation. It's also how we can carry out morning routines without effort, allowing us to focus on plans for the day ahead. Our ability to automatize activity greatly expands our scope of thought and action. What happens, however, when our automatic routines no longer serve a useful purpose? They remain as habit patterns and they are the activities, patterns, and behaviors we're most comfortable with. Many of the problems we face in life today reflect the fact that we're living patterns in the present that, at one time, had an adaptive value. Now they bring negative consequences. Consider the trader who hesitates before acting on a signal and, when he acts, does so in small size. That pattern of behavior was part of prudence during the trader's early learning period. It guaranteed that he didn't act rashly and impulsively, and it kept losses small. Now that the trader has learned and is showing profitability, the old prudent behaviors make him risk averse. Yesterday's solutions, carried forward to a new reality, become today's problems. To change an old pattern of thought, feeling, or action, we have to be willing to exit our comfort zone. 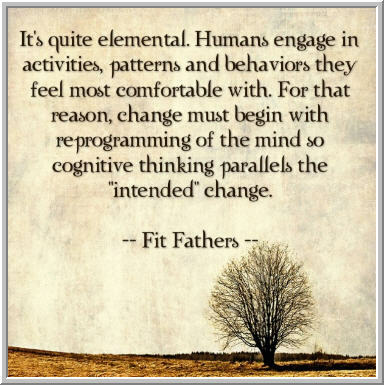 That means standing outside our patterns and actively viewing them as problems. At one time in the alcoholic's life, drinking was a means of socializing and a tool for feeling better. Fast forward to the point of alcohol abuse, and now drinking is bringing negative consequences for work, health, and relationships. Alcoholics who change view drinking as their problem, their enemy: they take the automatic pattern and use guilt, disgust, and anger to regain choice over how they think and what they do. Change begins when we view our problems as our problems. One of the most powerful change techniques in psychology is to take a pattern that is interfering with your happiness, fulfillment, and/or success and actively rehearse that pattern in your mind--visualize it, feel it--while you remind yourself of all the ways that it has hurt you. Literally, you're bringing that pattern to mind--maybe it's overtrading or trading too small--and imagining how many times you've flushed money down the toilet, how many ways this problem has stood in the way of your success. Can you imagine how angry you would become if someone hijacked your keyboard and screens and started placing random trades, losing you money? Well, that is happening to you every time your negative thought and behavior patterns hijack your trading psychology. Getting angry at those patterns is the first step in refusing to identify with them. It's a way of standing up for the healthy parts of ourselves and saying, "I'm not letting you hijack me!" Visualizing old ways of thinking, feeling, and acting that now bring us pain and allowing ourselves to fully feel all the disgust, guilt, remorse, and anger associated with the consequences of those patterns completely changes our trading psychology. We no longer fall into comfortable habits, because we no longer feel comfortable with those habits. We have turned them into enemies. That is powerful. This visualization and reframing is just one example of a broader psychological strategy of mental rehearsal. There are many other ways to use mental rehearsal to build new, positive habit patterns and to reprogram emotional responses to situations. This week's Forbes article looks at the science behind mental rehearsal and ways in which we use this method to change our lives. It's amazing how, when we change our mind about our problems, we truly change our minds. 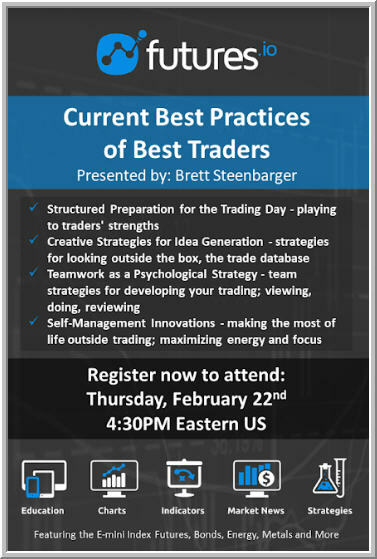 This Thursday, the good folks at Futures.io will be hosting a presentation where I'll be talking about the best practices of traders who are currently experiencing significant success. Because I work as a coach at multiple trading firms, I'm able to see who is doing well, who isn't, and what makes the difference. 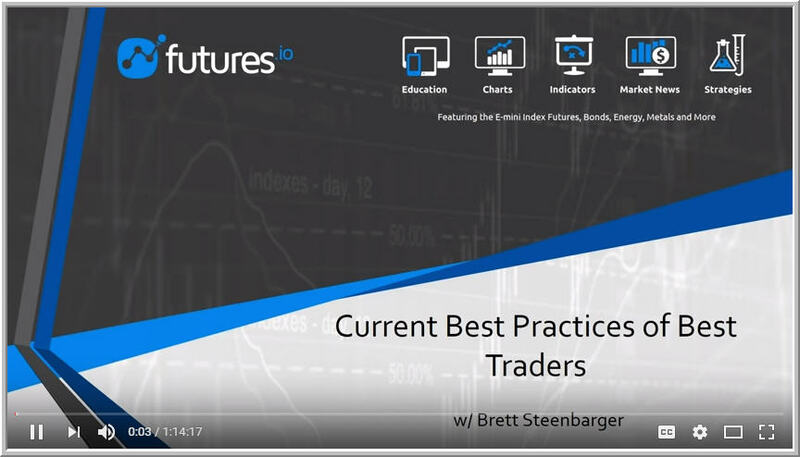 In this presentation, I'll focus on specific strategies that you can employ to replicate those best practices of best traders. Here is the link to register for the event. We'll be meeting up after the market close at 4:30 PM EST on Thursday, and there will be plenty of time for Q&A. Look forward to seeing you there! Many times, traders become frustrated and fall into a negative psychology because they are looking for one thing, while the market is doing something else. In that sense, frustration gives us information: that we are possibly out of sync with what we are trading. Above we see the S&P futures (blue line) plotted from February 12th through Friday's close (February 16th). If we were to create a regression line to best fit this action, we would see a line with a decent fit and a positive slope. That tells us there is a trend component to how the market is trading over that time horizon. Notice, however, the trend is far from a smooth upward line. The red line captures a dominant cycle within the trend, where a 50-bar rate of change is expressed in standard deviation units (left axis). Each bar captures movement in event time, not chronological time. In this chart, each bar is drawn when the futures have changed price 500 times. The event time bars adjust our time series for the volatility of the market's price action. When we have low volatility, we draw fewer bars and vice versa. Standardizing the market view this way provides us with a more stable time series, and that helps us better assess cycles within the market. Those cycles tell us when we are relatively overbought or oversold. In an upward trend, buying the market when we approach a 2 standard deviation cycle trough ends up providing pretty good entry. 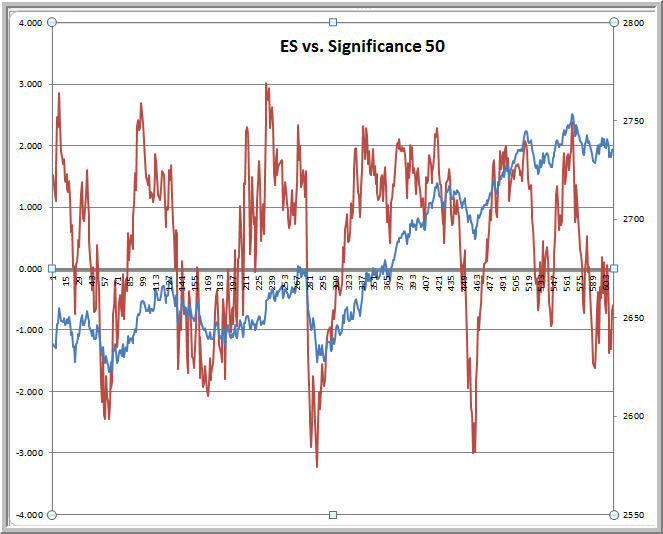 Indeed, we can define a trend by the presence of cycle troughs/peaks at successively higher/lower price levels. Notice also how the frequency of the dominant cycle gives us a window on how "choppy" the market may be--and how changes in the frequency give us a clue as to whether a trend is waxing or waning. Stocks or instruments displaying greater clarity/consistency of trends and cycles might be the best trading vehicles for a trader. Looking at price behavior in new ways opens new trading possibilities--and that can expand our psychology, fueling our understanding and sense of mastery. When we understand what is going on in the market, it gives us a psychological sense of clarity and control. Much of our worst, reactive trading occurs when we feel out of control. 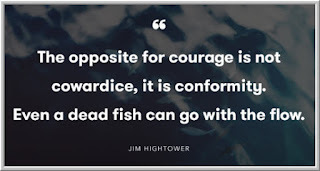 Looking closely at how the market is moving can provide us with understanding--and that can be tremendously helpful not only to our trading, but also to our trading psychology. In hearing from many traders recently, I'm finding that they are having a difficult time adapting to the market's shifting volatility. With volatility declining--and the volatility of volatility waning--we get choppier market conditions. With volatility expanding--and greater vol of vol--we see momentum moves. Many times, traders are zigging when they should be zagging because they are misreading--or *not* reading--market volatility. Above is a tool I created in about 40 minutes from historical data via the e-Signal platform. 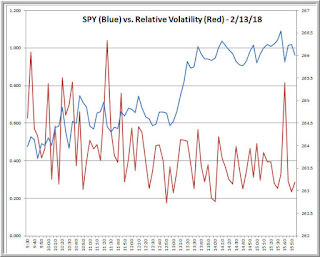 Here we're looking at the volatility (high/low range) in each five minute bar in SPY relative to the average range for that same time bar over the prior five trading sessions. So, for example, we're seeing how today's 9:30 - 9:35 AM EST bar compares in size to the average 9:30 - 9:35 AM EST bar for the prior five trading sessions. Note how, from the very start of trading yesterday, we were seeing relative ratios below 1.0. That means we're getting less movement in each time period than we've seen over the past week of trading. Very quickly that can alert you to the fact that this is not likely to be a high momentum market. In the lower volatility environment, moves are less likely to extend and we want to be more selective about taking trades and opportunistic about taking profits. Note also how it would be easy to create this relative volatility measure for any stock or index you're following. We typically look closely at price movements and trends; we're less likely to examine how volatility is trending. Adapting our trading to the market environment allows us to recognize when we should be trading moves and when we should be fading them. That can eliminate a helluva lot of frustration! OK, so recall what we talked about in the previous post that looked at how we can use volume to understand market movements: each day in the market offers us one or more important learning lessons. Our job in reviewing the day is to extract these lessons, so that we can improve our ability to recognize opportunities in real time. 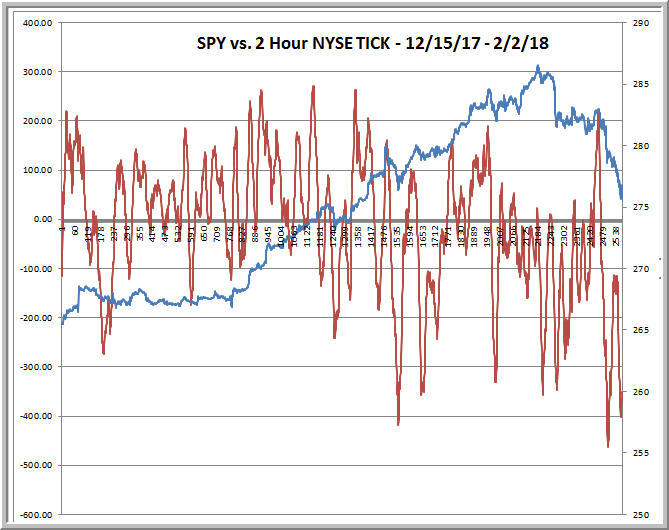 Above we see yesterday's market (SPY) plotted against five minute closing values for the NYSE TICK. Recall that we visited the $TICK measure in the first lesson post that dealt with changes of market regime over a period of days. Now we are examining the change of market character that occurred intraday in Friday's market. Note that the scale for the $TICK values is in standard deviation units, so that we can see how stocks are trading relative to a recent lookback period. Note how the $TICK line quickly moved below zero during the morning session and largely stayed below zero for most the morning. This tells us that stocks were persistently trading with weakness (on downticks) throughout those morning hours. Something interesting happened midday, however. As we made new lows in SPY, we were seeing much less selling pressure. Indeed, the final low was preceded by a sizable spurt in buying. From that final low, we saw a significant spurt in buying and stayed above the zero line for most of the remainder of the day. In short, we saw in transition from selling pressure to buying pressure, with a waning of selling preceding the upsurge in buying. The trader seeing this shift in supply/demand was alerted to the likelihood that this was not a trend day to the downside and, indeed, there were many traders leaning short who might need to cover. 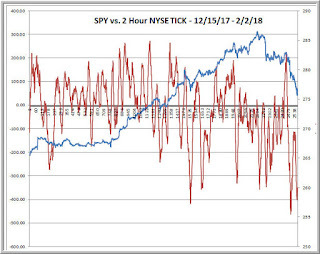 Notice also that once we surged above two standard deviations in the $TICK measure (both to the downside in the morning and to the upside during the afternoon), we tended to get follow through of price movement (momentum). Just noticing these dynamics helps keep a trader on the right side of market movement, knowing when to trade a market move and when to fade it. Every day the markets teach us lessons in trading and psychology. Our job is to become good students and learn from these lessons to improve our craft. In the first post in this series, we took a look at detecting regime changes by assessing shifts in buying and selling pressure. In this installment, we'll take a look at volume and its significance. 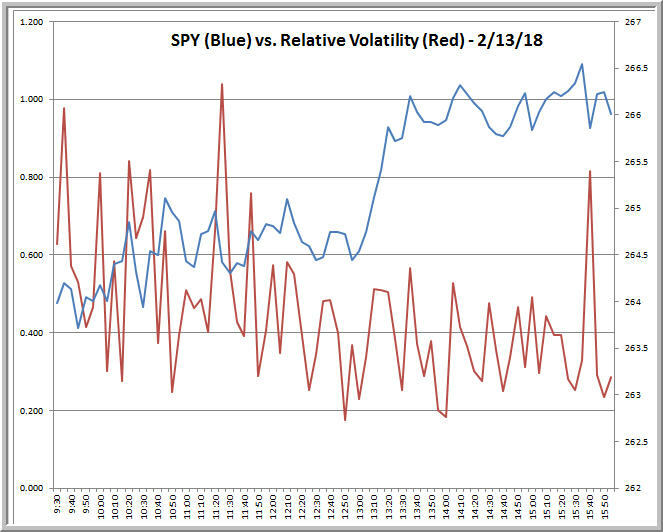 On any time scale, volume correlates very highly with volatility. During the recent decline, for example, we traded well over 200 million shares in SPY. During the low volatility push higher prior to the decline, we commonly traded under 100 million shares. Who are these additional participants? For the most part, they are value players trying to take advantage of unusually high or low prices; short-term directional traders trying to take advantage of the movement; and longer time frame participants stopping our of positions. In short, when we see added volume, it means that the proportion of directional traders relative to market makers has increased. This facilitates market movement. Conversely, when we see volume dry up, it means that directional traders are not perceiving opportunity in that instrument. That leads to less movement on all time scales and what short-term traders experience as "choppy". 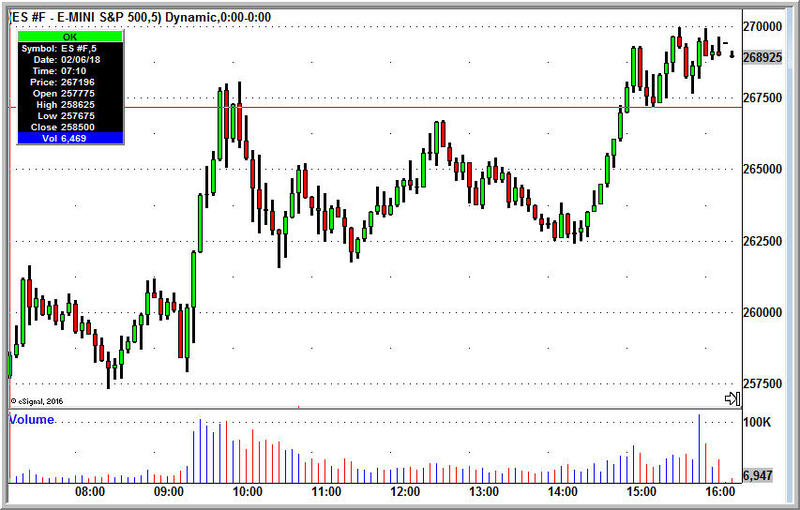 OK, with that in mind, let's take a look at yesterday's trade in the ES futures depicted above. A number of traders who sent me their journals made money on the opening drive. They recognized that we were oversold and that volume was strong at the open, with buying significantly exceeding selling. The combination of high volume, buying interest from value participants, and short-covering from those leaning the opposite way created a momentum thrust. An important way we can identify high volume at the open is with the measurement of relative volume. In relative volume, we take the average volume for each time of day (above we have five-minute time intervals) and see how today's volume from 9:30 AM EST to 9:35 AM EST compares with the average volume at that time of day. High relative volume tells us we have high participation from directional players. In the first three five-minute segments of the day yesterday, we had volume between 2 and 4 standard deviations above average. Note how having the right data helps you make the right adjustment in your trading. 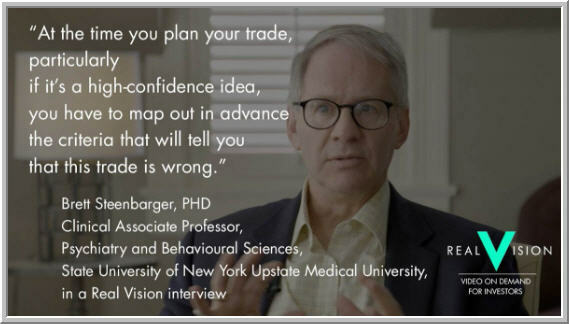 We commonly think of psychology as helping our trading, but approaching trading the right way--with the right information--is a big part of having the right mindset. Interestingly, a number of the traders who wrote to me and who made money in the early morning move gave back money midday. Why is that? Click on the chart above and you'll see how volume moved meaningfully lower in the midday hours. By the time we bottomed during the 2 PM EST hour, the average five-minute volume had fallen to about one-fifth of what we saw in the opening periods. With that waning of volume, we have waning volatility: no more momentum. Traders who did not pay enough attention to volume implicitly assumed that we were still in a momentum market. Every move was taken as a potential breakout--only to reverse due to the lack of participation. The trader who paid attention to volume was able to adjust expectations and either scalp smaller moves or stand aside altogether. When we get excited about making money, we often become tunnel-visioned and don't step back to see what volume is doing. Even worse, when we get excited, we don't step back to observe what is happening on the larger time frame. Notice how volume is drying up as the sellers are coming in. 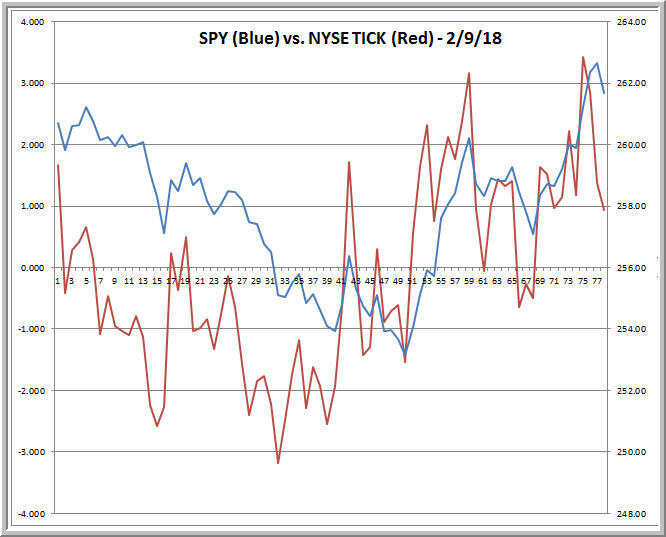 We had quite negative NYSE TICK readings during that 2 PM EST period and yet volume was drying up. Moreover, with all that selling pressure, we couldn't retrace more than about half of the early morning move. Recognizing that larger pattern set us up for the late day continuation of the upside momentum trade as volume picked back up. This is how psychology integrates with trading: The cognitive flexibility to shift between price action and volume and the flexibility to shift from moment-to-moment to the larger time frame complements the ability to track buying and selling pressure and its shifts. 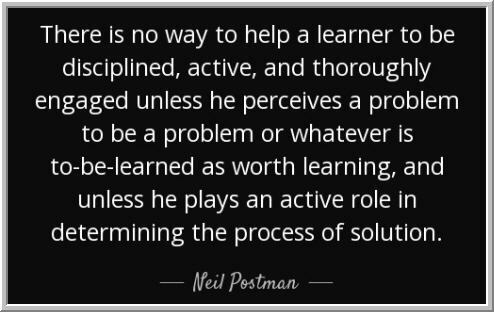 When we become self-focused and P/L focused, we lose that cognitive flexibility. We no longer trade with perspective. So much of trading success is using our psychology to detect patterns in the market's psychology. In this series of posts, we'll look at ways of integrating trading psychology and the process of trading. It is my hope that the series will illustrate the richness of the relationship between trading and psychology--a depth rarely captured in traditional writings on the topic. Note that for a good part of the first half of the chart, the NYSE TICK values stayed above the zero line. 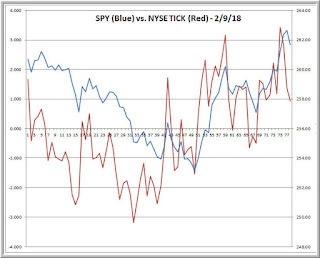 As SPY moved higher, we saw evidence of buying strength: more stocks trading on upticks than downticks. Look, however, what happened in the second half of the chart. The distribution of TICK values shifted and we now saw more selling pressure than buying pressure--even as SPY moved to all time highs. In other words, the psychology of the market changed--we shifted from a buying regime to a selling one--well before SPY made its recent correction. The change in the distribution of TICK values alerted us to market vulnerability. Here is an analogy: suppose the economy of the U.S. is quite strong in large urban areas of the east and west coasts, but weak everywhere else. A company's sales continue to rise, but when management looks at the distribution of sales, they see that fewer and fewer regions are holding up the rest. An alert management would not be high-fiving over record earnings. They would be reducing production and shifting the product mix to prepare for potential economic downturn. The psychological takeaway is that we need to drill down and look beneath the market surface and approach each fresh set of data with an open mind. On the day we made a peak in SPY, we had 599 stocks make fresh three month highs and 199 register new monthly lows. Two weeks before that, we had almost 900 new three month highs against 135 lows (data from Barchart.com). The open mind respects price action and market strength, but also is alert to cracks beneath the surface. Then, when price can no longer sustain new highs, volatility increases, and TICK readings become very negative, that alertness allows for a quick transition to the new regime. You have to have the right information, and you have to have the right mindset of openness. That is an important way that trading and psychology come together to create success. Trader Stewie recently pointed out something I've found in my own trading: trades taken primarily for emotional reasons rarely prove profitable. A number of the traders I work with email me their trading journals daily. It's amazing how often the profitable days are relatively simple and easy: the trader has certain ideas that they trade, certain ways of entering those trades with good risk/reward, and certain ways of sizing those trades and managing those positions. When they are patient and selective and focused, they trade the right ways without a lot of drama and they do well. Conversely, when markets are moving quickly and others around them are making money and they lose money on their first trades, trading becomes frenzied and frustrated. Patience and focus go out the window and the trader becomes reactive, chasing moves, trading marginal opportunities. That generally means entering positions at poor levels and getting stopped out. Now, yes, there are psychological techniques for becoming aware of our emotional responses, stepping back from them, and refocusing ourselves. But why do such disruptions occur so frequently for otherwise sane, level-headed people and what can we do to prevent them? A key to unraveling this challenge is examining the opposite of the trading frenzy: periods when nothing is occurring in markets. Action is slow, volatility is low, and things are chopping around. Is this a nice rest period for traders? Hell, no! Boredom ends up becoming as much as a trigger as frustration. The trader, feeling a press to make money and do something, tries to manufacture opportunity. Every move to an X minute, X hour, or X day new high or low is seized upon as the start of a trend and the mean reversion stops them out. The reason the boredom is so difficult to weather is that traders are *needing* some degree of excitement, challenge, and action from their work. They are trading to meet a set of emotional needs, not just to maximize their reward relative to risk. Similarly, they may be trading to outperform others out of a competitive need, or they may be trading to fill a missing need for self esteem. It is those unmet needs that impel the emotional responses and poor trading. Trading is a great endeavor, but it cannot be burdened with the expectation that it fill our personal emptiness. Imagine the surgeon who is bored in his life and looks forward to the thrill of cutting when he gets to the operating room. Is that really the physician who you want to heal you? The speaker who cares so much about the approval of the audience is the same speaker that suddenly goes blank and freezes up. Needing the outcome destroys the process of doing. This is why I am wary of traders who insist that trading is their great passion and who spend so much of their time watching prices. The successful traders I work with have complete lives that fulfill their passions. They don't need market action or thrill because they have plenty of stimulation outside of market hours. They don't need to prove themselves in markets because they experience their worth as spouses, parents, friends, family members, and as spiritual beings. Prevention is always the best cure. If emotions interfere with your trading, figure out the unmet needs that trigger those emotions and then figure out how you can begin meeting those needs *outside* of markets. You will have a calm, focused mind--and you'll be best able to surf the expectable emotional waves--when you have a fulfilling, gratifying life.